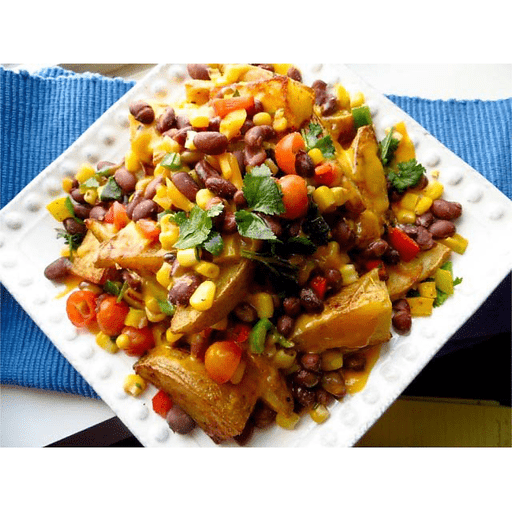 These Loaded Baked Potato Wedges are festive and fun! 1. Preheat oven to 425°F. Scrub potatoes and cut into ½-inch thick wedges. 1. Place potatoes into a medium size bowl with the canola oil, garlic, cayenne pepper and cumin. Stir well to coat potatoes with oil and seasonings. 1. Transfer to a large baking sheet lined with foil. Spread potatoes into a single layer. Bake for 30 to 35 minutes, stirring several times, until crisp and golden brown. 1. Top with Lime Black Bean Fiesta Salad and shredded cheese. Bake for 5 minutes more to melt cheese. 1. Serve with desired toppings. Top with guacamole and nonfat plain Greek yogurt (or sour cream). Calories 200, Total Fat 10g (Saturated 3g, Trans 0g), Cholesterol 15mg, Sodium 170mg, Total Carbohydrate 22g (Dietary Fiber 3g, Sugars 2g, Includes 1g Added Sugars), Protein 7g, Vitamin D 0%, Calcium 10%, Iron 6%, Potassium 10% *Nutritional values are an approximation. Actual nutritional values may vary due to preparation techniques, variations related to suppliers, regional and seasonal differences, or rounding.